I was provided with a ticket number for a service concern that really needs to be handled. The font on the guide page is way to small. X1 tech dept. says they have no way of changing. This is quite frustrating, and the problem needs to be corrected. "Guide" is not an option in my Tools/Preferences Menu. Any other ideas? Any help will be greatly appreciated! The original post was back when there was 2 types of guides, now there's only 1. As of now, you can't change font size. Thank you for your prompt reply. I'm not happy with it, but I appreciate your response. The font is more than big enough in my opinion. I like it how it is now. If anything the font is not BOLD enough. Funny but half the people who chime in on this issue think the font is too big. Too small guide letters and black background on guide. i have the X! system. The letters on my tv sets for the guide are too small to read. The black background on the guide should be able to be changed. When will this be fixed? Is someone working on it? Who is working on it? Why is it taking so long to be fixed? Re: Too small guide letters and black background on guide. 1. Is watching too small of TV from too far away. 2. Is watching an older TV that the picture has faded over time. 3. Has the picture settings on the TV set dreadfully wrong. Hi, I had the X1 installed last Friday and I too am having trouble with the guide letters being to small and with the black background. Maybe it's the really bright white letters against the black background. I can adjust the lighting on the cable box but not the guide. Hoping this will be fixed soon. Thinking I may have made a mistake switching to X1. Thank you and take care. Don't remember what I posted here, but I guess EG doesn't approve! I wish someone would post a picture or video of what they are seeing. There is one exception; our white letters are whiter/thicker than this picture. A 2-minute google search didn't fnd one lthat really looks like ours. mrm555mrm, take any response from Rick with a "grain of salt". That choice is up to the individual but I am a 37 year veteran of the AV field. I am a CEDIA trained and certified home theater system designer and project supervisor. I am highly respected in my field. I might just know a thing or two about this. Apparently everything works perfectly for him. Yes it does and I am quite happy about that. He's also appointed himself the keeper somebody's gotta do it... LOL of these forums and is quick to scold anyone who dares to offer a critique of the X1 platform if it has been previously posted. If I "scold" anyone it is because they complained before they researched the topic or actually took the time to learn the product. I am not fond of the "complain first, learn second" philosophy. 90% of the questions or concerns posted in this forum can be solved by a 30 second Google search. Be assured there are those of us who have real issues with the X1 platform, Nobody has offer more help in this forum then I have. The "numbers" speak for themselves. That being said, there are many other helpful people in this forum who I have the utmost respect for and they know who they are. who don't read every post and who actually believe the more an issue is reported, whether in a previous thread or a new one, some action may be taken by Comcast. Now that may be a naive view based on the number of issues that have not been fixed, addressed or at least acknowledged by Comcast, but we can hope that someone there is listening. Roughly two months ago, I exchanged emails with a Comcast employee who hinted people that NEEDED to pay attention to this forum might not be... I was a bit disappointed. I stand everything I have said about guide font size and legibility. I think it is wonderful in it's current form. But I have always said I support the ability to adjust guide size which the original X1 guide offered (but very few people used). 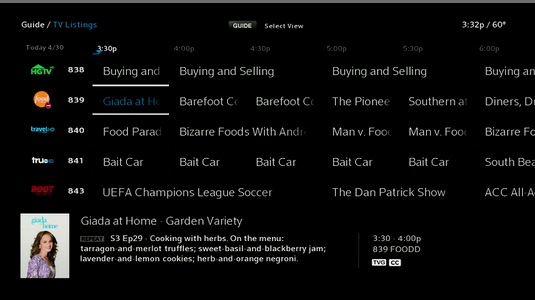 If Comcast restored the ability to adjust guide font size, I would be all for it. I would set it smaller on at least one of my TVs. I googled on comcast x1 guide. Mine looks like that as well. I have my "Background Darkness Level" set to 1. Earlier the morning I was watching "CBS This Morning". They scroll a "news ticker" across the bottom of the screen. It occurred to me that they use white letters on a black background. I decided to take my observation one step further. I measured the smallest capital letters I could find in the current X1 guide. They are 9/16" high. Then I measured the letters used on the news ticker on CBS This Morning. Whadya know... they are 9/16" high. I guess cbs needs to make their font larger as well! lol! If you would like, you can adjust the transparency on the guide. Unfortunately right now we do not have access to adjust the font size on the guide. This is NOT a solution! We know that. HOWEVER I need to remind you the first X1 guide did have choices for guide font size. Also when you say "right now" and "access" you are leaving yourself open to countless questions. Such as what does right now really mean and who does and does not have access and what does access really mean??? I tried your suggestion as to changing the background density, it didn't cure my problem at all. I have a sight problem and need larger Font, like my old system allowed me to have when I entered into Guide/Program Listings. Please, I would ask that Comcast consider those that have a problem with their eyesight. We are not all perfect when it comes to our vision. Visually, white printing on a black background is not the best choice, especially the blue printing on black background. My white printing is also splotchy, not clear and sharp. My TV set is 31"
Thank you for the reply. I spoke with an Accessibility Supervisor on my floor regarding this issue. He would like to compile a report to send to our engineers regarding this issue. I have your account info, so please provide a 1-2 sentence explanation of the issue and I will create a report for him. You may have anyone you know message me regarding unacceptably small font size on the X1 guide and I will include their account info in my report. Bigger the report, better results. Please include me in this issue regarding the font and contrasting background. I previously commented on this issue. Why would you ask a customer to do research on an issue that Comcast claims to be very aware of? We are the customers. You are the service provider. You should be doing the research and providing the needed feedback to your supervisors. Better yet, why don't you find all of the threads in this forum relating to guide font size, copy the links and send them to your supervisor. Rick. I do plan on doing my own research and looking up users on other threads about this topic. Let me clarify my request: If you guys know anyone who has the same feelings towards font size on their X1 guide please let me know. I am working with an Accessibility Supervisor who wants to compile this report. No other research is required other than getting in touch with me. Please keep in mind this issue might not be fixed by dinnertime, but we need to present a solid report to our engineers in order to foster change. I appreciate your patience. I will compile information for you and a list of Comcast customers who have stronger opinions about this than I do. The very first thing that should be on your report is why did the original X1 guide have font size adjustment and the "new" guide does not? Also, if you are reporting to an "accessibility supervisor", why is this person not monitoring this forum? I have a feeling this person is well aware and we are doing peon work. I also have a need to have a larger font (also fatter) and the ability to change the hilite color. That blue is not very visible on some TV's maybe a bright green might work better. I urge anyone that has concerns about guide font and guide appearance to send a private message to ComcastBrandon as he just stated earlier he is collecting information on this topic for his supervisor. Blue? What is blue on your X1? On the guide the selected program shows in blue letters while the rest are white on a dark background. Ok, I understand. It sounds like your 31" TV is the problem. Be sure to let ComcastBrandon know. Yes, I already PM'ed Brandon. By the way, it is a 40" NEC monitor that I also use as a TV, and it's picture quality is otherwise very good. I'm not sure any PC monitor will give the same clarity as a TV. This is a close copy of what I see. My whites are a lot brighter, though. Robert I tries to give you ten kudos, however it would not let me! Sorry to the op ,some of us on here just like big tvs! FYI: tries is not a typo, that is how it sounded in my head at the time! Please add mine to your list of complaints. 1. The high contrast of white on black is too harsh and strains my (and others') eyes, even at the lowest darkness level, which is only available on the guide, not the Xfinity ribbon. 2. The small font exacerbates the issue as one must look more closely and longer to view content. 3. The miniguide of the older system is much more user-friendly, IMO, as one could continue to watch the program and surf at the same time. Moreover, it was much easier on the eye, with low contrast. New systems should not exclude the positive aspects of old systems. Terrib I think they are listening now. I just did my Comcast insider survey and it asked me a ton of questions regarding font within the system. also about the guide in general! In fact about every single major issue that has been going on they asked those questions...this is a first!!!! Please send Brandon a private message with your concerns. Thanks for the kudos...knocked me off my chair...lol . I think you are correct that their ears are OPEN now. I have not had a survey sent to me in a couple of months and I sure wish I had gotten the one you did. Do you have any clue as to how I cann get back on the list to get surveys? I messaged Brandon and repeated the link to CNET article that shows font options last year under general settings. This is NOT something knew they have to develop. RIck, I really hope you are wrong. If they have to go back to the drawing board the change will never happen. Fingers crossed. Rick I think you are on the right trac.........again as I said before putting some of the features in the cloud MAY skate copyrights!